NetMinistry has been designing church websites since 2002, serving thousands of churches, ministries, and Christian businesses with an amazing website and content management platform. It's one of the oldest church website brands on the internet, started by Christian internet entrepreneur, Jose Gomez. Our company is based in Tampa, Florida. We've been designing websites for years. With every client, our design team led by Chez Boodparset creates a masterpiece that takes hours to perfect. One day, we realized how much inventory of church website templates we had accumulated over the years that we could share with churches for their church websites. When you purchase a church website template from this website, you have several options. 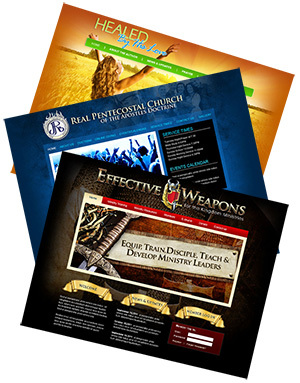 All options provide a customized church website template using the design you choose as the inspiration. We swap out the graphics and branding of each template for your own. You can choose to (a) simply take the PSD, HTML, and CSS files and install the template on your own hosting account, (b) have us install the new design on our church content management system with basic page management options, or (c) have us install the new design on our church content management system with advanced options like a church database, online donations, and more. We are excited to offer these options and encourage you to contact us with any questions you have. Let's try to answer a few questions that clients frequently ask us. Do I receive a cookie-cutter church website template or is this a custom design? Every website template that is ordered is custom designed. The templates you see on this websites are examples of the work we have done. When you order a specific template, we use that as the inspiration, but we change the branding and images to match your organization. The end product is completely custom. Do I own the church website template once I purchase it? For our standard $99 program, we create a custom church website template and grant you a license to use the website template for one website. An outright purchase of the design is available for an additional cost. Your representative can discuss options with you if you wish to purchase the design exclusively. Do you have photography and images for me to choose from? Yes. We have partnered with a large stock image company to provide you with millions of images to choose from included in the design price. How quickly can I expect my church website template? We deliver your design in three business days, whether you choose to receive the PSD/HTML/CSS files or have it installed into our church content management system. Do I receive any rounds of revisions for the $99 price? Our $99 program includes a consultation with our product team so that we can gather your specifications and photography/graphical assets. We then customize the template per your request. If you would like additional revisions of your design, you can purchase additional rounds for $50 per revision.